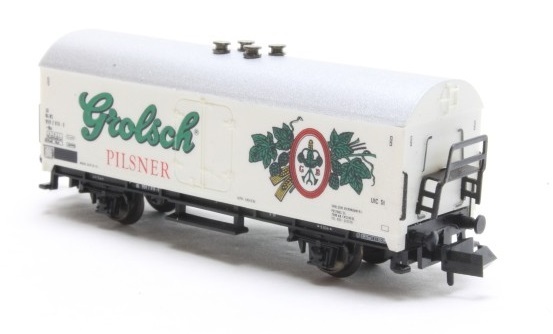 13810 NS Grolschwagon "Grolsch Pilsner"
Grolsch Brewery (Koninklijke Grolsch N.V. - "Royal Grolsch"), known simply as Grolsch is a Dutch brewery founded in 1615 by Willem Neerfeldt in Groenlo. In 1895 the de Groen family bought the brewery. They had started their own brewery in Cuijk the Netherlands in the early 19th century. It held a significant stake until November 2007. It is located today in Enschede and has been a part of the SABMiller group since March 2008.It was awarded the Koninklijk (Royal) title in 1995. 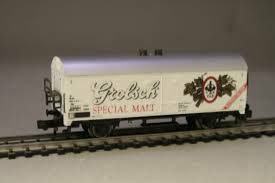 13837 NS Grolschwagon "SPECIAL MALT"